Elanne Thompson coordinates the Palliative Care Volunteer service in the historic town of Berry in the Shoalhaven area. The service has many long-term volunteers in its ranks and is not short of new-comers. “We don’t usually advertise, people come to us because Karinya, our Palliative Care Unit and our Community Palliative Care Team are held in such high regard in the community”, said Elanne. Significantly, about 30% of their volunteers are now-retired clinicians or have an aged care/disability service background. The service is well supported by the Karinya Palliative Care service. For acting Nurse Unit Manager (NUM) Ben Dootson it is his first experience with volunteers since moving into Palliative Care from a Critical Care background. Inpatient volunteers interact with staff directly, and a weekly meeting of community staff considers which of their patients could benefit from volunteer support at home. 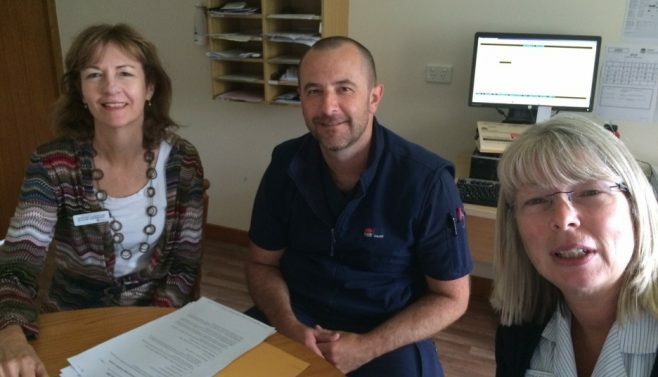 The other Palliative Care Volunteer service in the Illawarra Shoalhaven LHD is managed by Cynzia DeiCont at Port Kembla, and creating consistency and sharing support is something that the managers in Berry and Port Kembla are working on. Berry is a good example of a volunteer service well supported by the clinical team and embedded in the day-to-day clinical care of patients. Hi Kathy. So glad to hear you are interesting in volunteering.